The Public Relations Society of America (PRSA) is the world’s most prominent organization dedicated to the professional development and advocacy of PR and communication practitioners. Join us every month to hear from industry experts, network with your peers and share best practices. 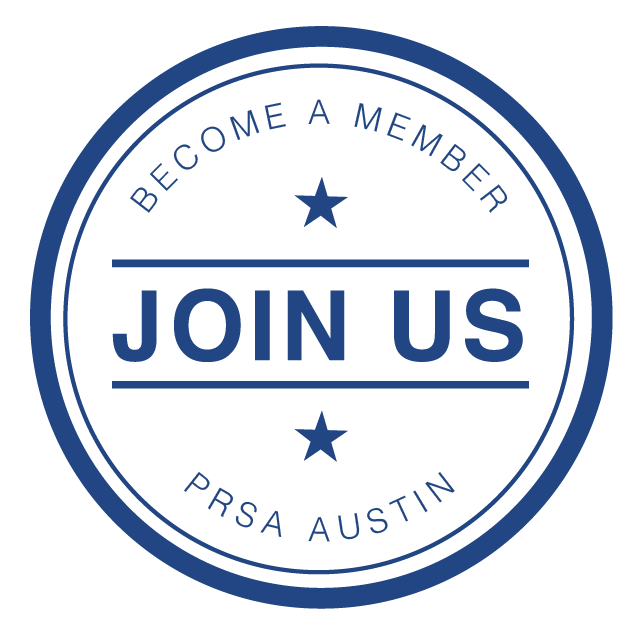 The Austin Chapter of PRSA is a dynamic group of public relations professionals dedicated to the advancement of the profession of communications. Our members benefit from a wealth of educational information, professional services and networking opportunities locally, regionally and nationally. Whether employed in technology, government, corporate, agency, not-for-profit or other industries, PRSA Austin Chapter provides access to helpful resources for seasoned executives, mid-career managers and those who are new to the profession. Join PRSA Houston and members from the 13 chapters in the PRSA Southwest District for the 2019 PRSA Southwest District Conference, taking place April 24-26 at the Whitehall Hotel in Downtown Houston. 2019 PRSA Austin Chapter Board Announcement & Member Survey! Our Board recently approved our Diversity Statement. We are committed to bringing quality programs to Austin and serving our diverse community of members. Please help us by taking our member survey. View our current job board and see what's available in the Austin PR industry. Reach hundreds of communications professionals by posting your job opening with PRSA Austin Chapter. Benefits include online listing, dedicated eblasts sent directly to membership and more! Learn more now! The Austin Chapter is hard at work to bring our members exclusive discounts to local festivals and conferences, business tools, and more. To learn more, join PRSA Austin today! Interested in becoming a PRSA member? Become a sponsor of PRSA Austin Chapter, and your name could be featured here! Find out more.